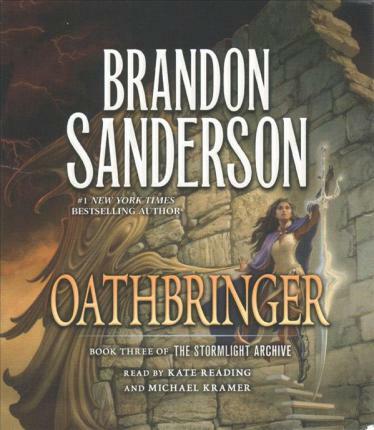 In Oathbringer, the third audiobook in the New York Times bestselling Stormlight Archive, humanity faces a new Desolation with the return of the Voidbringers, a foe with numbers as great as their thirst for vengeance. "[This] is a character-driven book, and Kramer's and Reading's portrayals will help listeners settle in for the intertwined plotlines as the protagonists carry out their separate but connected stories. Each narrator draws on a deep reserve of voices and accents while maintaining a quick pace. Equally adept with dialogue, rumination, and long narrative passages, they make the hours fly by." --AudioFile Magazine on Words of Radiance, Book Two of the Stormlight Archive. An earphones Award winner and 2015 Audie Award Winner. Brandon Sanderson grew up in Lincoln, Nebraska. He lives in Utah with his wife and children and teaches creative writing at Brigham Young University. He is the author of such bestsellers as the Mistborn(R) trilogy and its sequels, The Alloy of Law, Shadows of Self, and The Bands of Mourning; the Stormlight Archive novels The Way of Kingsand Words of Radiance; and other novels, including The Rithmatist and Steelheart. In 2013, he won a Hugo Award for Best Novella for The Emperor's Soul, set in the world of his acclaimed first novel, Elantris. Additionally, he was chosen to complete Robert Jordan's Wheel of Time(R) sequence.